When it’s time to buy a shiny new flat screen, we’re only human, and we tend to want the largest TV we can reasonably afford. Bigger is always better, right? It’s hard to shake that feeling, but an 80-inch LCD just doesn’t make sense if you’re rocking a studio apartment. You could buy a TV on a whim, hoping that it fits perfectly within your space—if you don’t mind forking out restocking charges if (OK, when) it doesn’t work out. Or you could always grab a tape measure and try figure it out with actual math. But c’mon, just because we’re nerds doesn’t mean we’re math nerds. 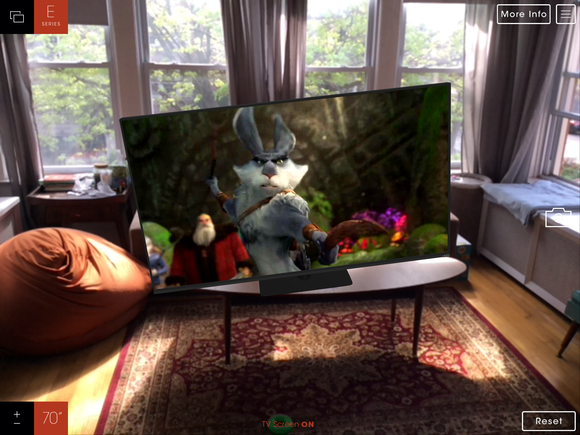 Vizio has another option: The Vizio Showroom app allows you to do some research while staying perfectly lazy. 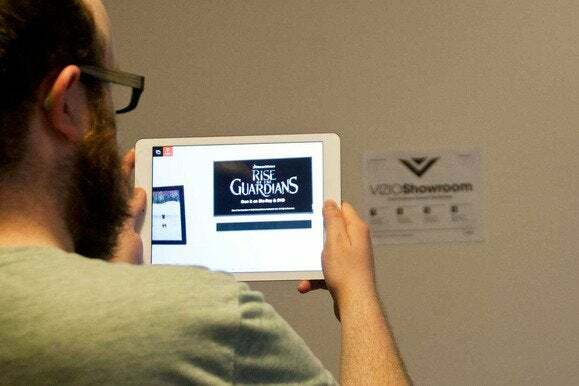 Once you grab the free app for iOS or Android, you’ll print out a provided marker that helps the app discern the scale of your surroundings, and watch as it drops a virtual television into your living space. Just like that. 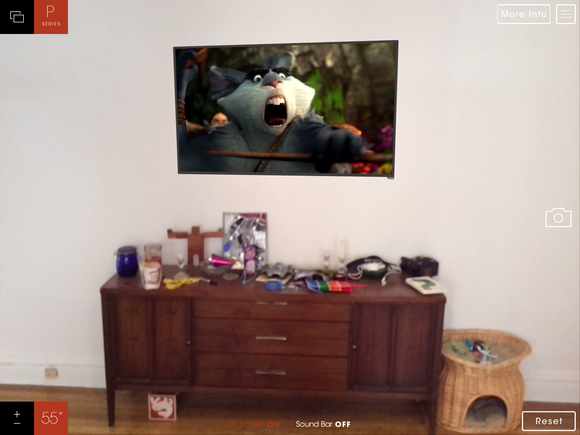 The app can digitally impose a TV in your room, but unfortunately, it can’t digitally remove clutter. We’ve seen similar apps for chairs and couches—boring stuff. But with Vizio Showroom, you can easily envision how a TV ranging between 23 and 80 inches would look in your living room, bedroom, kitchen, or wherever else you might have a hankering for a new screen. You can even attach a sound bar below it, in case you’re looking for a little virtual surround sound in your fake TV-owning life. What’s neat is that the app can show you not only wall-mounted arrangements, but also freestanding tabletop options, letting you get a sense for the different display possibilities within your home. Simply place the printout on a table, put it in view of your device’s camera with the app running, and it’ll show you an upright Vizio sitting on your table or countertop. 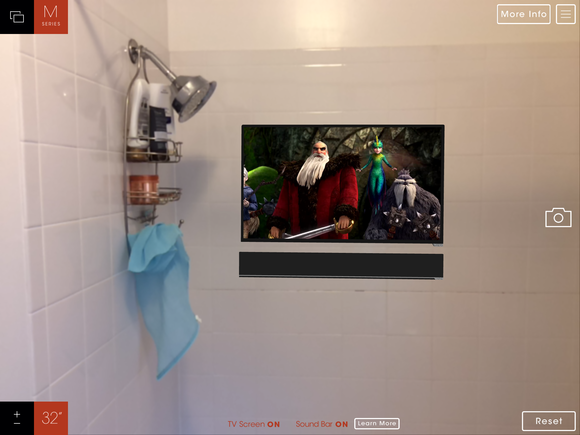 However you have it aligned, the faux set will show a looping clip from the innocuous-looking kid flick, Rise of the Guardians. How would a 70-inch set look on my coffee table? So glad you asked. When it works well, the overall effect is pretty solid, though the grainy background visuals make screenshots look like hilariously rushed Photoshop mishaps. However, the display is prone to odd glitches, which result in your virtual flat screen juddering rapidly against the wall or tilting oddly on a tabletop, as the terribly disconcerting image above can attest to. Luckily, tapping the Reset button usually does the trick and realigns the set to its intended destination. Once everything’s all lined up and to your liking, you can snap an image and save it to your device or post to Twitter or Facebook. (Because what fun is having a pretend TV if you can’t brag about it?) Curiously, though, there’s no option to actually buy any of these Vizio sets from within the app—you know, should you wish to re-create your digital TV-owning fantasy in your actual dwelling.